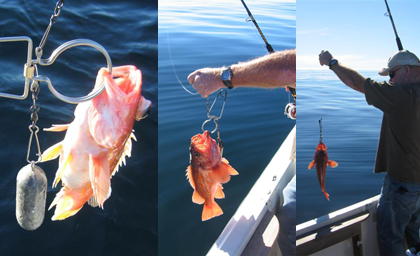 In experiments undertaken by marine biologists with several species of common Southern California Rockfish, including Vermilion, Flag, Squarespot and Honeycomb Rockfish, as well as Bocaccio, eighty-three percent of fish caught at depths between 66m (217ft) and 107m (350ft), survived when returned to depth within two minutes. The odds of a fish dying following recompression nearly doubled with every ten minute increase in time at the surface. Qualified university studies confirm the actual fishermen’s facts, that over the last ten to fifteen years the size of the Rockfish has reduced in size by approximately twenty percent along with a decrease in fish population. EcoLeeser would like licensed fishermen to be aware of the problem and support sound methods to returning the fish to their natural habitat after being caught. EcoLeeser urges fishermen to please release unwanted fish. The RokLees provides the same benefit to other species of fish that can suffer from Barotrauma, such as fresh water bass, fisherman can successfully release their catch. Use the RokLees as an important conservation tool that is beneficial to all because it helps preserve and grow our fish population for the future.